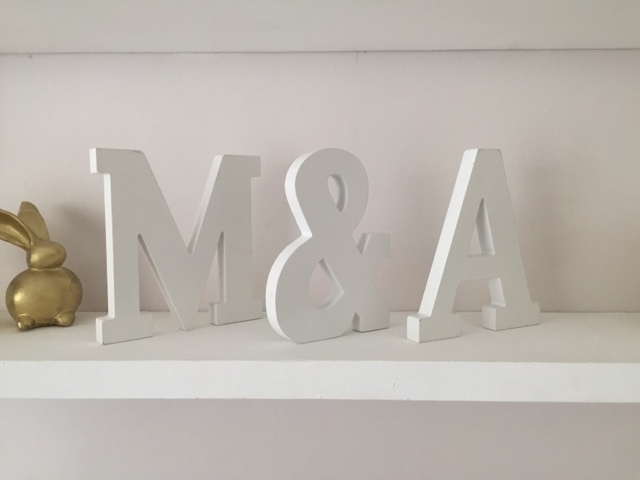 The Gilded Lifestyle: A double surprise and a nursery reveal!!! This post is long overdue but hopefully worth the wait... In May, I gave birth to my twin girls which was a huge surprise, or should I say shock, to most of my family and friends! We knew that I was expecting twins, but we chose not to tell anyone. We found out at 6 weeks at an early ultrasound. It was the hardest secret that I have ever kept but so worth it when I saw the excited reactions of our nearest and dearest! 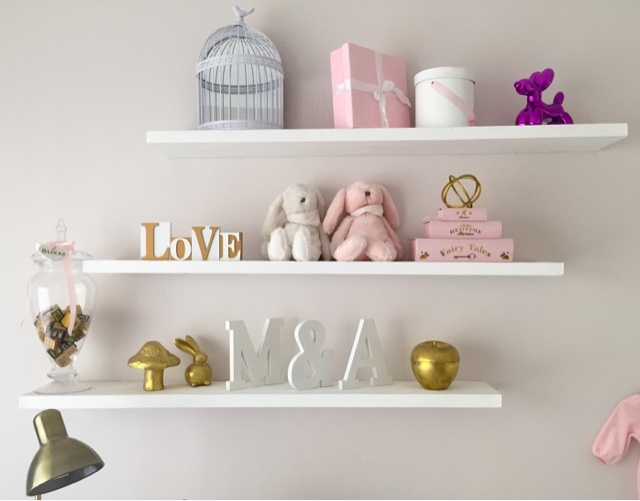 We started by painting the walls a gorgeous pale grey with pink undertones. 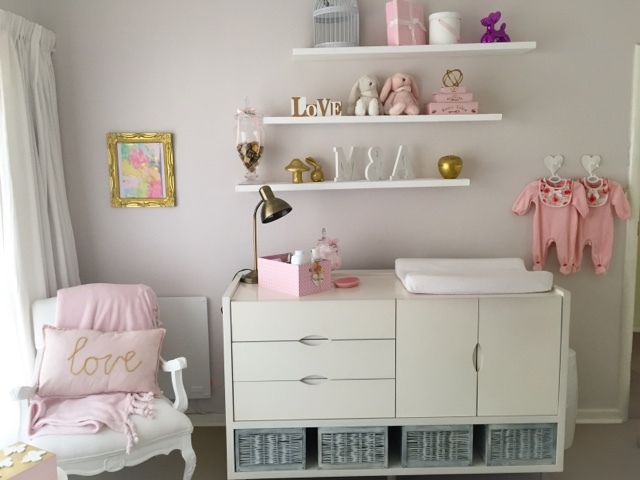 The cots and changing table were custom made. 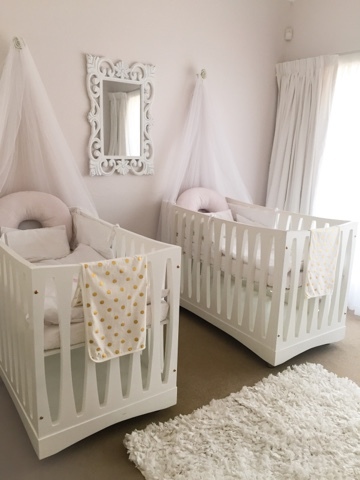 It was actually Buddy's furniture and I still loved the modern look so we had a second cot made to match. 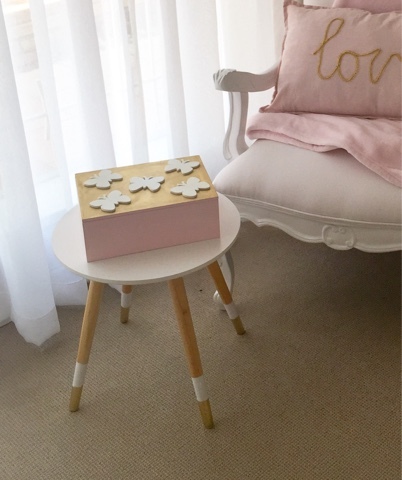 I purchased this side table and sprayed the tips of the legs gold to add some glam! 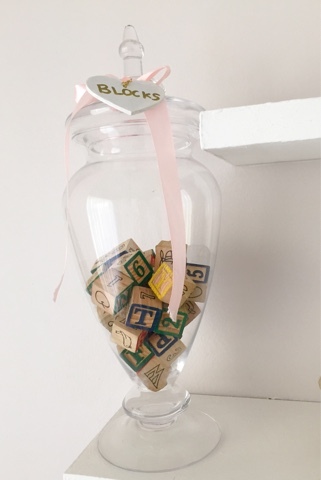 We added floating shelves above the changing table which creates a lovely feature and a spot to display their keepsakes. The girls' initials...A gift from grandma. 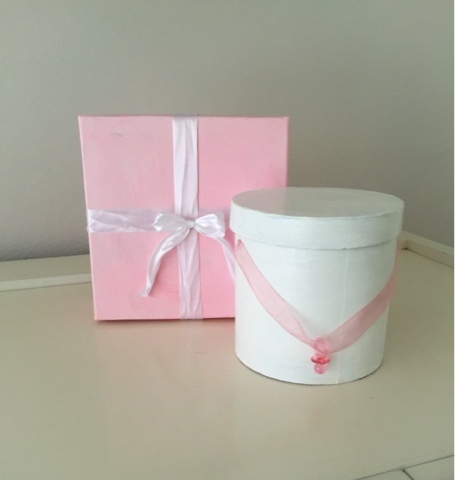 I painted these boxes with my Buddy's help (or should I say supervision?) during my 'nesting stage'. 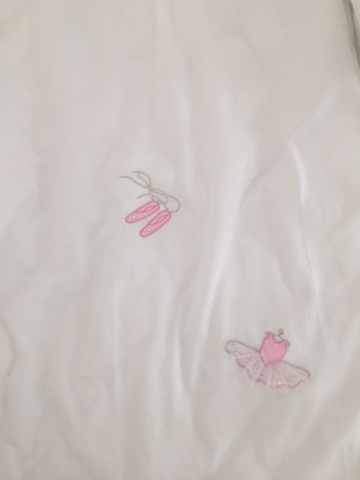 He wanted everything to be perfect for our little princesses! 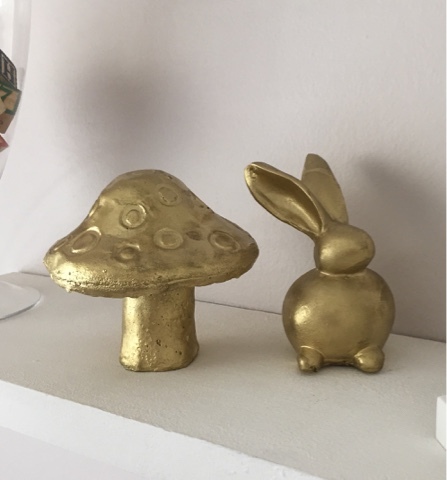 A gold bunny and toadstool for some cuteness...I went a bit crazy with a can of gold spray paint! 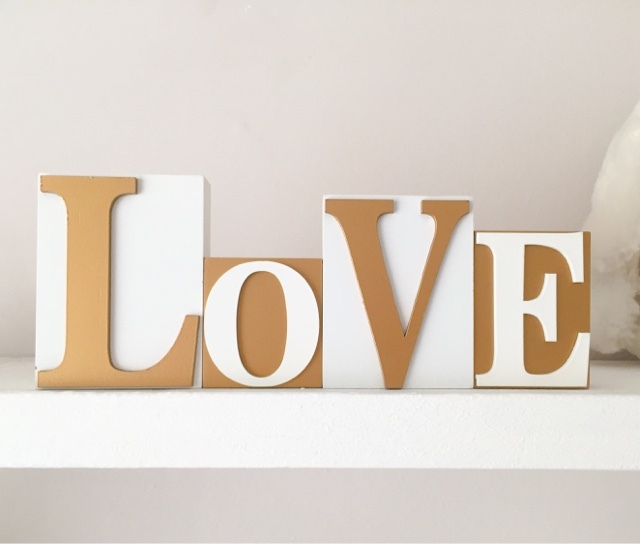 Gold and white wooden alphabets to spell 'LOVE'. 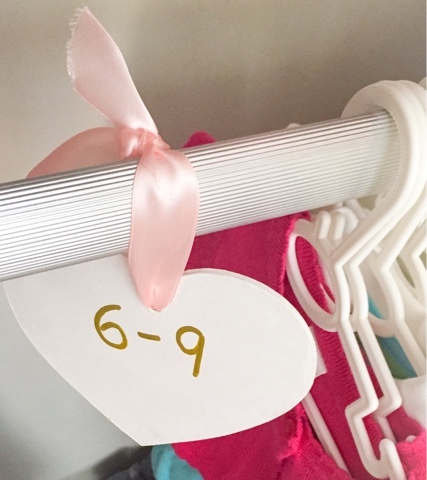 These heart shaped hooks next to the changing table are so convenient. 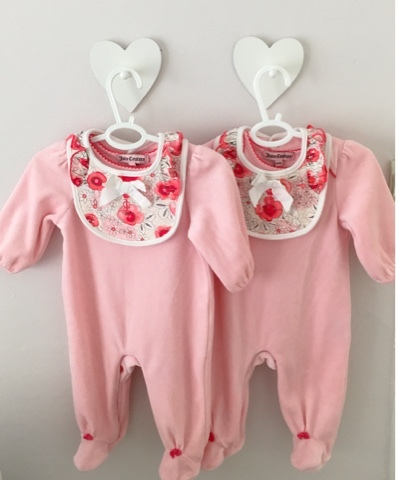 I usually choose and hang their outfits up the night before so we have a less stressful time in the morning choosing their outfits. I do the same with Buddy's clothing...With my hands so full at the moment, every bit of pre-planning helps! I did not find any linen to my liking. so I had some custom-made. 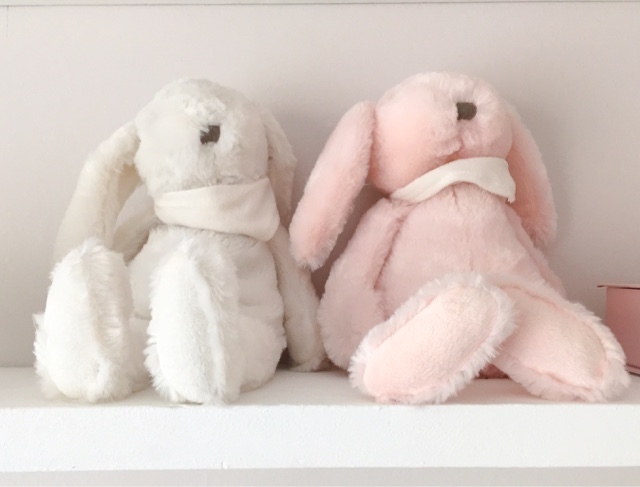 These pink and white bunnies were Buddy's first gifts to his sisters'. Aren't they just adorable? 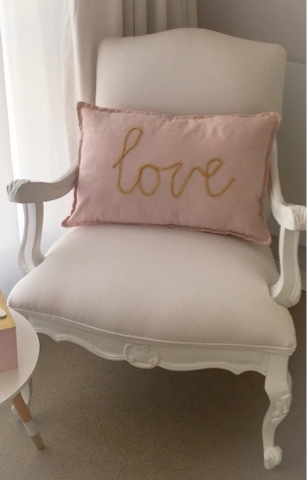 I hand sewed gold braid onto a pink scatter cushion to form the word 'love'. 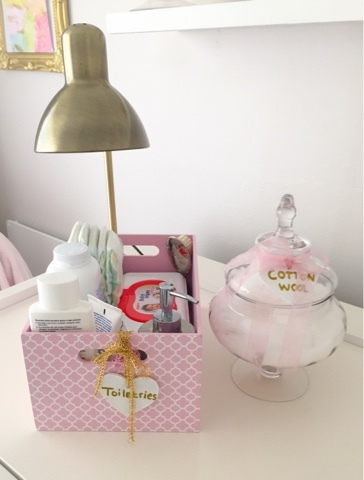 A pink wooden box used as a toiletry caddy keeps everything corralled together and accessible for double diaper changes. 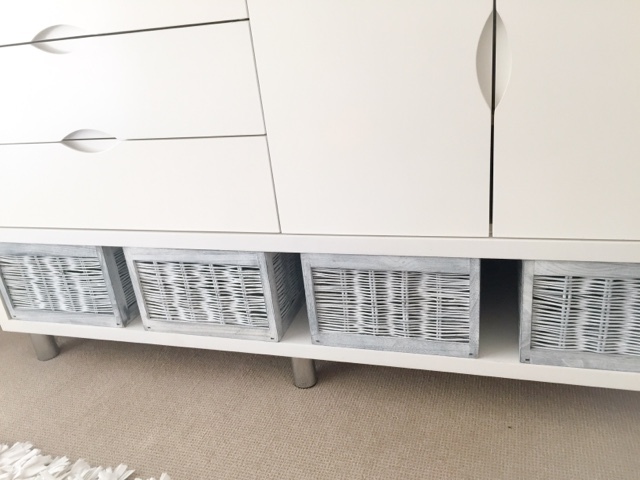 At the bottom of the changing table, we use these grey baskets to store toys. These heart-shaped closet dividers make life so much easier! And, they are so easy to make... I made smaller ones to tie onto some storage baskets as well. I'll post a tutorial when time permits. 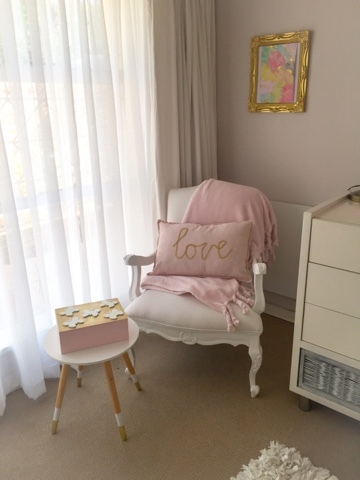 Our girly, gold, pink and white nursery is complete and it is exactly what I envisioned for my little princesses... I hope that many happy memories will be made in this space! If You Make One Thing This Week...TEATIME!